Nature is the creator of wonder and all living things are birthed from its womb. As an admirer of nature, Tiffany has always regarded nature as a source of inspiration. It respects nature. Tiffany respects life. It continues to draw inspiration from the rich and magnificent natural world to create countless classics. An industry leader in sustainable development and the protection of wildlife, Tiffany has always held on to the goal of protecting the natural environment and has drawn upon its own strength to be a voice in the defense of wildlife. Joining and actively participating in the cause to protect it as a way of giving back to nature for the selfless gifts it has provided. Since 2016, Tiffany has been closely observing the status of wild elephants on the brink of extinction and has partnered with the Elephant Crisis Fund to initiate this journey focused on the protection of elephants with the event #Knotonmyplanet. 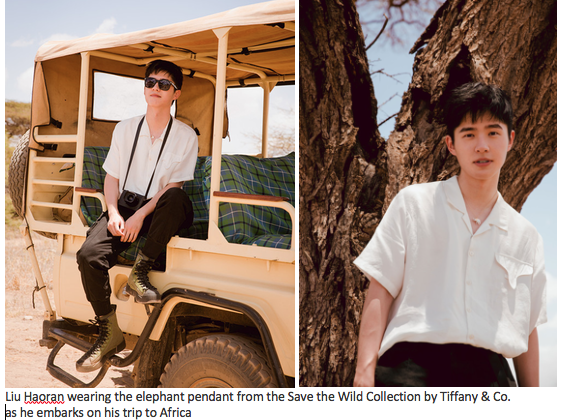 Tiffany is also donating all the profits from its Save the Wild Collection limited edition elephant pendants and brooches to the Elephant Crisis Fund. The Fund uses the money to help put an end to the illegal hunting of elephants, combat the illegal ivory trade and curb the demand for ivory. Tiffany has always held to a philosophy of conservation, protecting nature and wildlife and has committed to a donation target of 4 million USD, fulfilling a solemn promise to protect one of the most well-known species of the natural world. 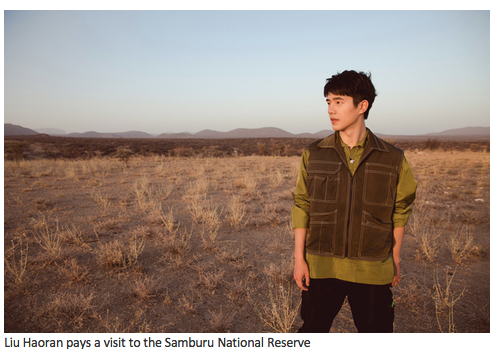 Tiffany joined young actor Liu Haoran on his journey to Africa in 2019, deep in the interior of Kenya. 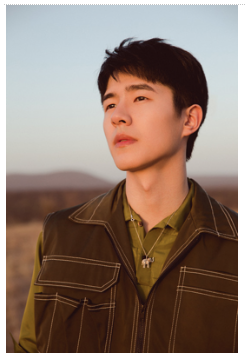 Focusing on the threat of extinction facing the wild elephants in Africa, they explored the territory of the wild elephant in a personal and intimate journey through the lens of Liu Haoran by following in their footprints where he hoped to be a voice for their protection. Elephants have a long fertile history of reproduction and because of that they are one of the oldest and once most dominant animal species on the planet. However, the escalation of the ivory trade has put wild elephants on a gradual path to extinction. In a bid to focus greater public attention on their protection and to help secure their future, Tiffany followed Liu Haoran to faraway Africa’s ‘natural zoo’ - Kenya, the wild elephants’ paradise, to experience and explore the mysteries of their day-to-day survival. 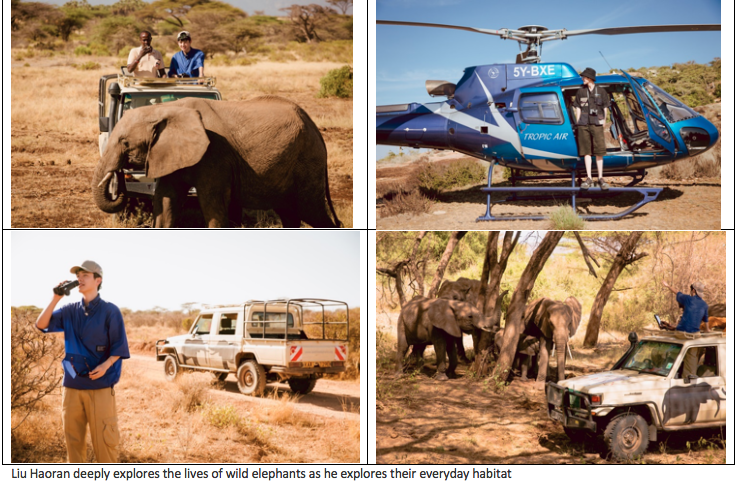 Kenya is Liu Haoran’s much-sought destination: a land filled with magical colors and the birthplace of countless creatures, which captures his heart the moment he stepped there. Here humanity lives in a primeval simplicity with wildlife free to gallop on seemingly endless plains, in a life together in harmony with the laws of nature. The magic of the creator is put on full display in this land. The first stop on this trip is the Samburu National Reserve, located in north-central Kenya, which is home to all manner of wildlife including the gentle and noble elephant, the proud lion, the tall and strong giraffe, and the quick-footed zebra, among countless others. Wandering the plains of Kenya, you observe the endless stream of life as it rushes at you in all of nature’s marvelous complexity. However, a crisis is brewing behind this seemingly vast and peaceful backdrop: the survival of precious creatures such as the wild elephant is under threat, even extinction, due to a lack of resources and humanity’s selfish desires. 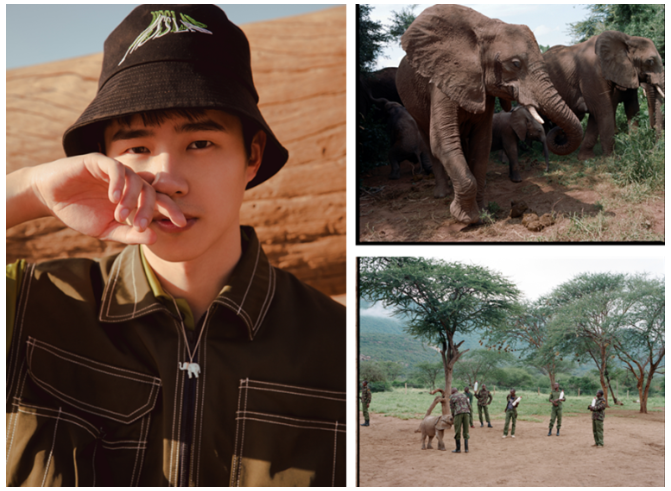 Liu Haoran pays a visit to the wild elephants’ natural habitat with the organization ‘Save the Elephants’ in the ensuing trip. 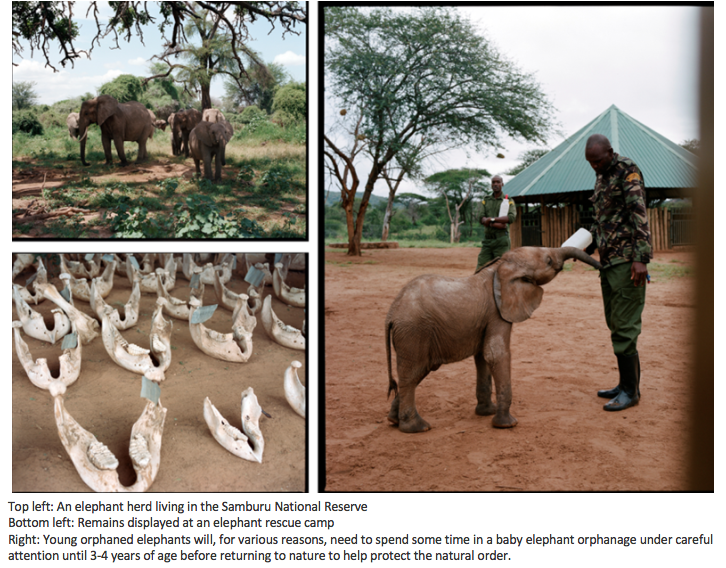 Here they explore the trajectory of elephant activities and are integrated into the lives of the local native inhabitants to obtain a deeper personal experience of the land which has nurtured these wild elephants and of their present conditions of survival. 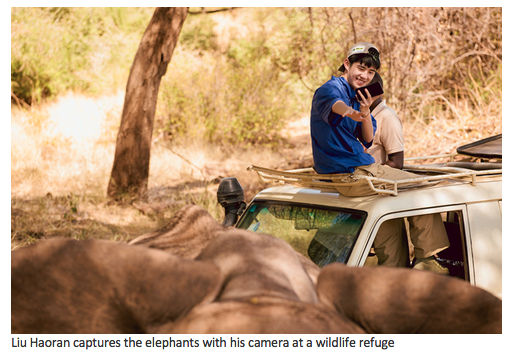 Liu Haoran finally gets an opportunity to witness the elephants firsthand as he cautiously follows in the herd’s footsteps and surreptitiously observes their lives, capturing it all in his lens. The elephants seem to shrink to tiny individuals under the vast prairie backdrop as they advance with mighty steps in the struggle for survival. Their increasingly close interactions give Liu Haoran a greater personal sense of the preciousness and fragility of their lives as well as a stronger understanding of the significance of protecting them. 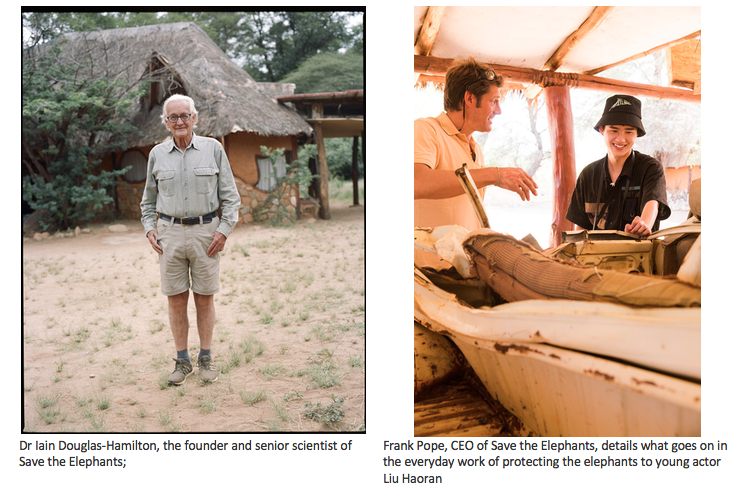 Tiffany and Liu Haoran have a private conversation on wild elephants with the founder and senior scientist of Save the Elephants, Dr. Iain Douglas-Hamilton, and CEO of Save the Elephants, Frank Pope, to gain a deeper understanding of their current survival conditions. Dr. Iain Douglas-Hamilton is a leading figure in elephant research and at many conservation expos and is also the founder of Save the Elephants. 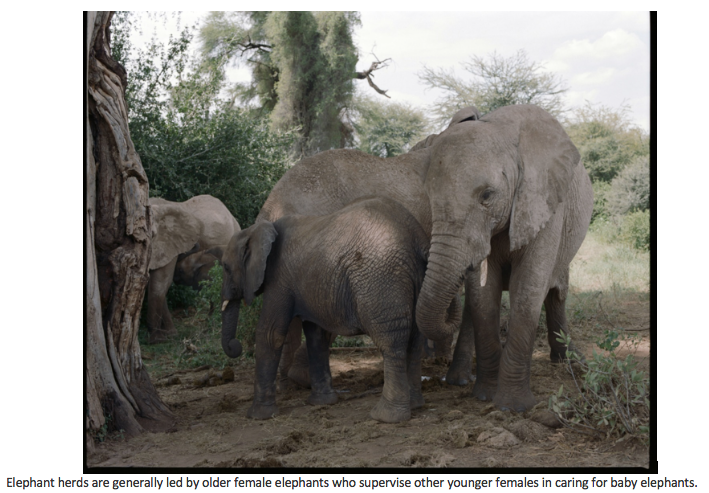 He has been involved in the study of wild elephants since 1965, being one of the first scientists in the world to look at individual elephant behaviors more closely. Through his professional perspective, Liu Haoran has gained a greater recognition understanding of the dangers the ivory trade poses to wild elephants. The reality is that wild elephants are no different than primitive human tribes in that the groups are actually very peaceable, although they may seem violent, and it is the unshirkable responsibility of human beings to protect them. This conversation may have seemed more like a general knowledge primer on wild elephants, but it was in fact no different than a mental awakening. Tiffany has always looked upon nature as its mentor for inspiration, which makes its protection and the protection of the planet an unshirkable moral responsibility. 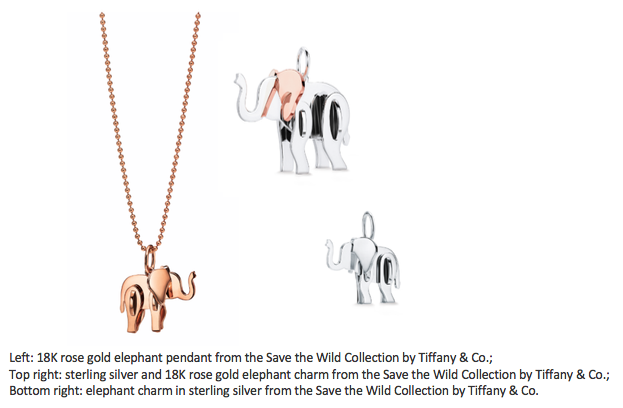 Tiffany & Co. launched the Save the Wild Collection to realize its promise of helping to protect wild elephants. Its profits go to the Elephant Crisis Fund. The Save the Wild Collection is bold in its conception, presenting exquisite three-dimensional jigsaw-like pendants slotted together from metals, vividly recreating an image of an elephant as well as presenting brand-new rhino and lion-designed pieces. At the same time, Tiffany has solemnly promised to donate all the profits from the Save the Wild Collection to combating illegal elephant hunting and the ivory trade all over the world and toward curbing demand for ivory with concrete actions, thus playing a crucial role in helping to resolve the crisis it poses. Wild elephants are an integral part of the African Savanna, and also one of the most highly symbolic groups of a planet rich in species. Wild elephants are now gradually approaching the brink of extinction as a species from once staggering numbers following many years of massive, human-induced destruction of their habitats and countless instances of rapacious and illegal ivory trades. The journey to save the elephants has also itself gradually evolved into a kind of redemptive act for humanity - an act of protection for our home planet and a reflection on humanity’s future. Nature is an integrated whole. It is upon this whole that every species must rely for sustenance as its indispensable keystone. Tiffany is hopeful that this tour of the habitat of the wild elephants in Kenya may make people more deeply aware of how endangered the wild elephants are now. Humanity must establish a ‘bridge of friendship’ with the animals in the wild in order to find a more perfect balance between the wilderness and civilization: we must reject ivory-made products and animal performances in any form; we must enthusiastically put ourselves to the task of protecting wild animals and make the relevant information accessible to everyone... Tiffany will continue to dedicate itself, as it has been always done, to protecting wild elephants and nature and to a restoration of their former vitality through its promotional activities and actions.